Quilting Jetgirl’s Quilt-Along is underway and I can’t resist jumping in given how much I love the pattern she designed. I am finding many inspirational ideas from her site and the participants so far! The theme is befitting to me. I love snow and I love shimmers! 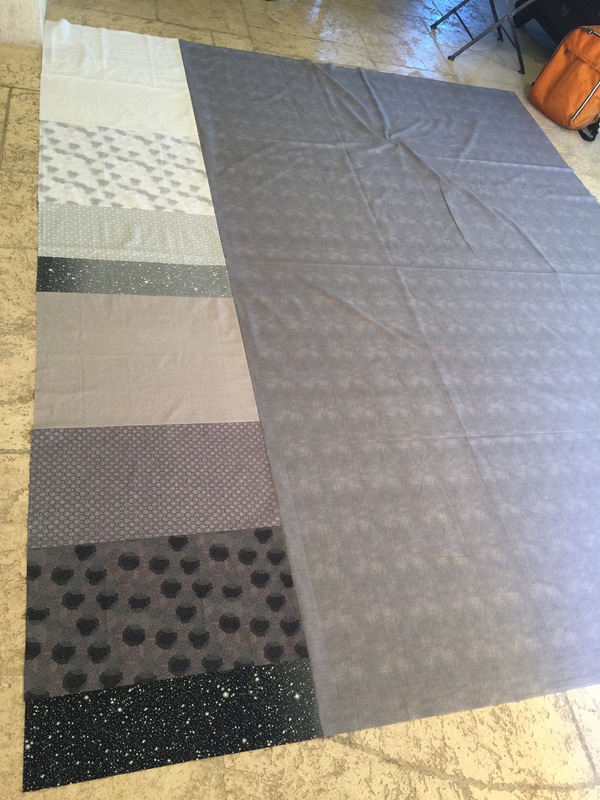 After much back and forth on color selection, for my final set of fabrics I went for black/gray, grays and whites however, I am going scrappy as no one snowflake or star is alike. I’ll be deciding on how scrappy I really want to be as I cut into the fabric. 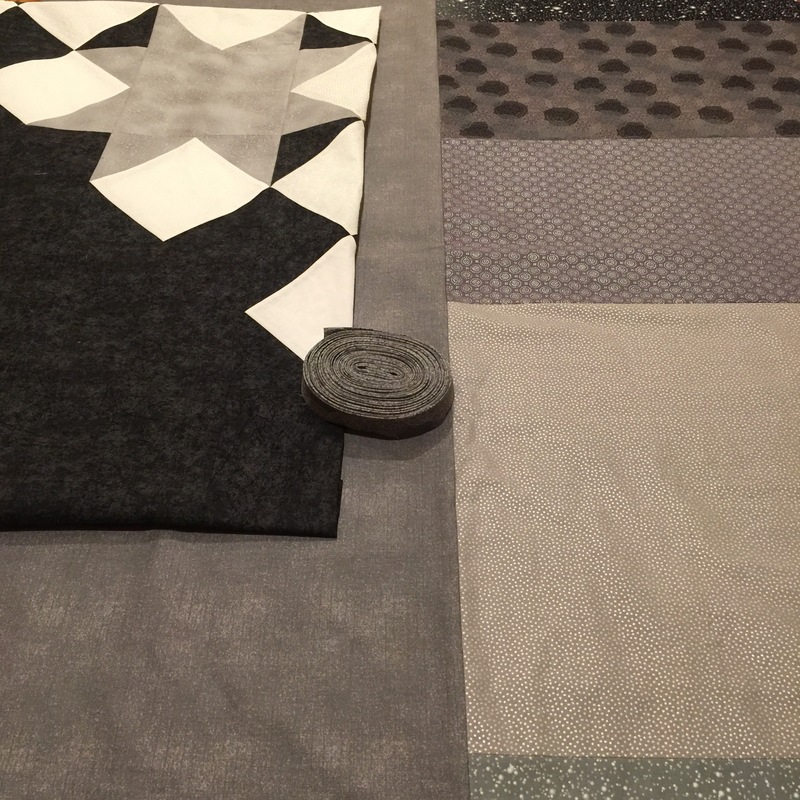 I have three choices for the binding and will also narrow that down as the quilt comes together. I pulled the whites in reflection of various snow conditions we enjoyed this past fall and winter, including random snow days and ski moments in the Sierra Mountains. Who knew how many whites there are out there?! Sunny, gray, muted, sparkly and glistening come to mind. The dark grays I pulled to reflect the diversity of stars, shimmering, glittering, shining and sparkling. Each of these against an evening sky background fabric of gray on black. It is coming together, in fabric piles for the current moment. One of the top three fabrics lined up side by side at the top of the photo will be for the binding. I couldn’t decide at the store so I took a bit of each of them home, justifying it to myself as a stash building opportunity for the two project rejects. August 5,2016 Let the Cutting Begin! I feel like I’ve been eagerly awaiting the cutting instructions and when they arrived, was very ready to slice through the multiple fabrics. I couldn’t put a stake in the ground yet on the binding so I left that for later. Look how pretty the fabric is, all cut and ready to go! August 21, 2016 And the Piecing is On! I’ve been on vacation for the past couple of weeks, and brought my sewing machine with me to get caught up on projects. 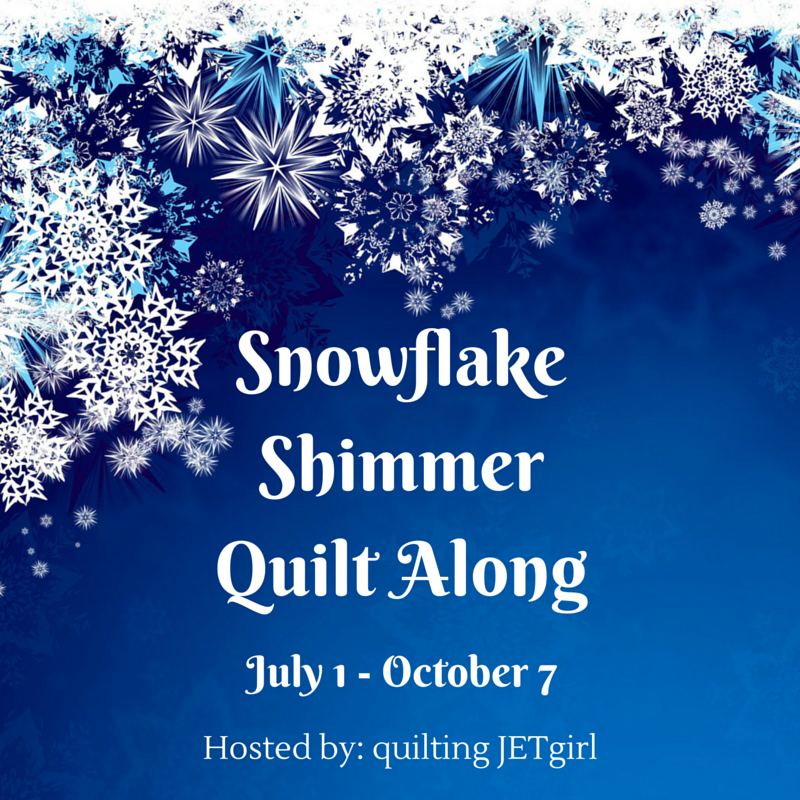 This Snowflake Shimmer QAL is so much fun for me. I love the square in square blocks we are creating and found Yvonne’s tutorial very helpful for making these for the first time. Here is this week’s progress, for the blocks which are not yet trimmed. I had the best of intentions to have the quilt top fully pieced by the link up, but alas, time got away from me and the best I could do was piece the rows together. I laughed when I read the quilt’s designer Snowflake Shimmer QAL recent Instagram post; the heading started with “I will sew today, I will sew today” which she followed with all the things she needed to do post vacation. It was a great reminder of life and the many courses it takes us on. Furthermore, what I thought were perfect SiaS were not always, despite following instructions to the T. Apparently more practice is required, though the rows look beautiful and I hope that only I can “I Spy” a mistake or two in the final flimsy. This project has been great fun and I am grateful for a Yvonne’s guidance and inspiration along the way. Looking forward to sewing the rows together and moving on to quilting it. I have quilted 3 small quilts in the past. Nothing this large, and the quilting I did was with no knowledge of how to do it. Fortunately, in today’s world there are amazing bloggers I can learn from. The quilting process must begin. Chuckling my way through a too over-sized quilt back but will enjoy having the sandwich made so I can dive into the quilting. Goal is to right size the back tonight then sandwich. Despite the greatest of intentions, this wonderful quilt will not be fully quilted by the end of the Linky party. I started quilting on another QAL project and quickly recognized that even with a great new machine, that quilting takes time. And Patience. While I have plenty of patience, I don’t have plenty of time and concede to life’s interruptions as part of the quilt making process. So here is the final pre then post sandwiched quilt and the hopes that I can get some quilting in on this beauty before early October settles in. Finished SFS quilt sandwich. 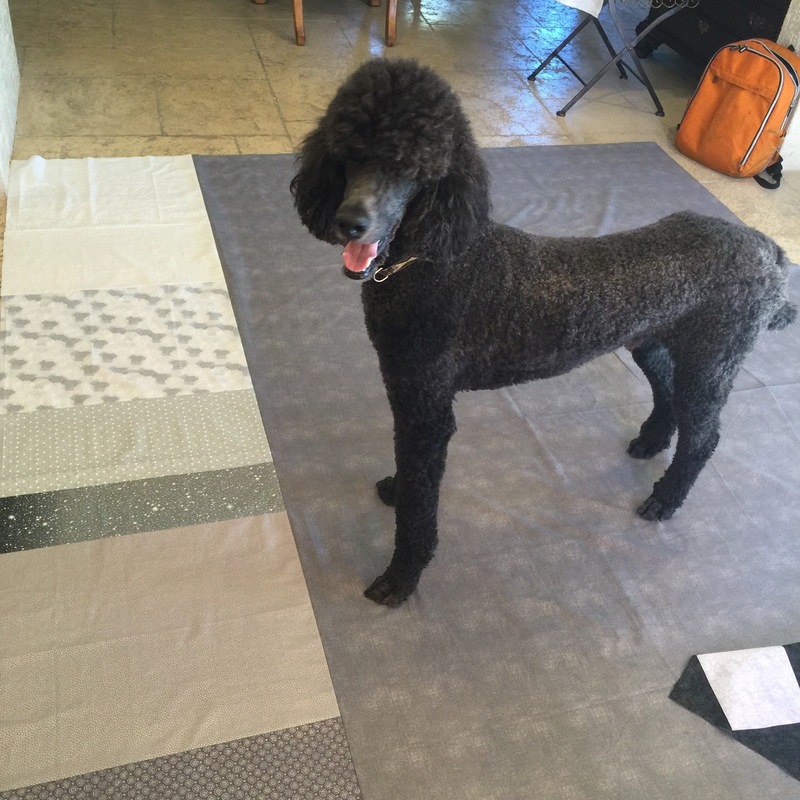 Sam is calling it his own before it is quilted. Thanks to Yvonne at Quilting Jetgirl for the fantastic QAL experience, tutorials as well as her very warm approach to the quilting community. I look forward to seeing these turn into a quilt! Your square in a square blocks look great! Really love your fabric choices. I’ve saved the pattern, but am already drowning in UFOs. I’m enjoying looking at everyone’s quilts. Yvonne, thank you so much. It was really fun and I will definitely share the finished quilt when completed. I look forward to continuing to follow you on your blog which is very inspirational!